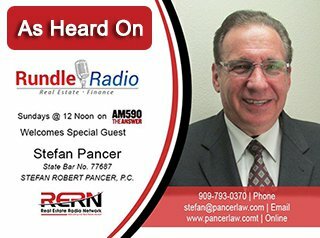 Stefan Robert Pancer of Pancer Law was recently asked to be a guest contributor on the Rundle Radio show. Stefan discussed bankruptcy law, the current laws regarding bankruptcy in California, and gave advice to those who are thinking of filing for bankruptcy. The Rundle Radio show is part of The Real Estate Radio Network and provides expert information in real estate, finance, and related industries.